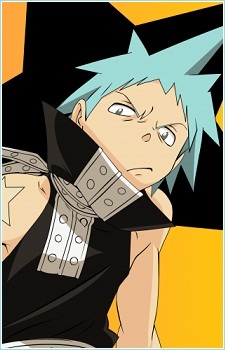 Black☆Star is one of the main Meisters that the series follows. Black Star is one of the survivors of the infamous Star Clan, The other being Akane☆Hoshi. Which explains why Black Star has a star on his shoulder. His Demon Weapon partner is Tsubaki Nakatsukasa. He is a Shadow Weapon Meister (暗器職人 Anki Shokunin in Japanese) which is translated into Dark Arm Meister in the English dub. Currently, he is a Two-Star Meister and a member of the elite student unit, Spartoi. He is the descendant of a powerful and deadly assassin White Star, who Mifune fought previously. Like White Star, Black Star always holds a grudge, namely against Mifune, who beat him up twice previously. He eventually is overcome by anger and goes after Mifune, and wins, but harnesses his anger (simultaneously mastering Tsubaki's enchanted sword mode) and defeats Mifune fair and square.